If you are using the timesheet functionality for invoicing purpose you might run in to trouble when you need an overview on what your teammembers have done on a dask on a specific date. 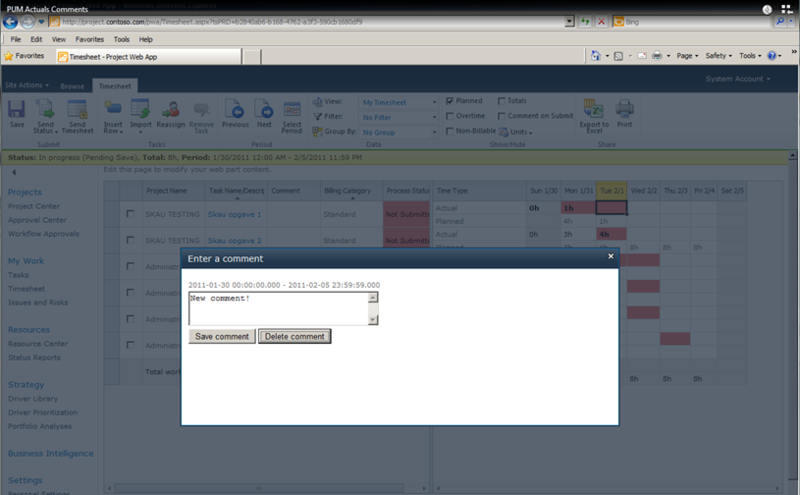 The reason to this issue is that the timesheet only allows comments to be captured for the entire period pr. task. My company Projectum (www.projectum.dk) have now develop a simple module/add-on that enables you to right click on a cell in the timesheet grid, allowing you to enter your comments. For reporting purpose, all daily comments/notes will be saved to the Project Server database (SQL) in an already existing table.